Translation from Estudos Sociedade e Agricultura, Rio de Janeiro, vol. 18 no. 1, p. 127-157,Abril 2010. Key words: family farm, agricultural census, Brazilian agriculture. (Agricultura familiar no censo agropecuário 2006: o marco legal e as opções para sua identificação). Visando delimitar a agricultura familiar no Censo Agropecuário 2006, o Ministério do Desenvolvimento Agrário (MDA) e o Instituto Brasileiro de Geografia e Estatística (IBGE) elaboraram metodologia para construção de uma variável identificando os estabelecimentos agropecuários recenseados e que se ajustam ao conceito previsto na Lei n.11.326, de 24 de julho de 2006. O texto apresenta os passos metodológicos utilizados e alguns resultados. Palavras-chave: agricultura familiar, censo agropecuário, agricultura brasileira. Based on a collaboration between the MDA and IBGE, the 2006 Agricultural Census made possible the filling of an important breach in official information for public policies on rural development: how many farming families there are in the country, where they are located, and how and what do they produce. On July 24, 2006, Law n. 11.326 was sanctioned, which establishes the guidelines for formulating the National Policy on Family Agriculture and Rural Family Enterprises, providing the legal framework for family agriculture and permitting its inclusion in the official statistics. Various scientific works and research groups have already conducted similar efforts with the results from previous agricultural census, but a categorized conceptual limitation of family farming was required which would attempt to satisfy the legal statement of 2006. To accomplish the delimitation of family farming, the MDA and IBGE worked in a mutual regime of collaboration, transforming the statements from Law n. 11.326 into algorithms. the solutions suggested in the 2010 Global Agricultural Census Program (Programa del censo agropecuario mundial 2010), elaborated by the Food and Agriculture Organization of the United Nations - FAO in 2007; the categories of the National Classification for Economic Activities (Classificação Nacional de Atividades Econômicas-CNAE 2.0), elaborated by IBGE in 2007, in accordance with the International Industrial Classification Standard for all Economic Activities (Clasificación Industrial Internacional Uniforme de todas las Actividades Económicas-CIIU) and the guidance of members from the Advisory Committee of the 2006 Agricultural Census (IBGE, 2009: 29). For the execution of the Agricultural Census, the questionnaires were substituted from paper to hand-held computers, the Personal Digital Assistant-PDA. Information was also collected that was georeferenced to the agricultural establishments, providing a basis for the formulation and the evaluation of future public policies. To present the delimitation of family farming accomplished by the 2006 Agricultural Census, this article is divided into three sections. The first relates a brief evolution of the principle legal framework surrounding the concept of family farming, while the second section describes the criterion adopted for the limitation of family farming within the Agricultural Census. The last section presents the main results of the delimitation of family farming in accordance with the previously described criteria. Before presenting Law n. 11.326 it is best to remember that the concepts closest to that of family farming are not unprecedented in the Brazilian legal framework, it is therefore important to register its evolution over the last decades. The Federal Constitution of 1988 protects small rural property operated by the family from attachment in order to pay the debts incurred by its productive activity, and specifically provides the means to finance its development (article 5º, item XXVI). Furthermore, it makes them insusceptible to expropriation for the purpose of agricultural reform in small and medium-sized rural properties, as defined by law4, so long as the proprietor does not own another (art. 185). As one may observe, the Land Statute and the Constitution bind the familial character to property ownership, not including producers with a precarious or temporary access to the property. This concept of "family property" remains unaltered in agrarian legislation. Nevertheless, when dealing with Social Security, the Constitution used a differentiated form to identify rural workers, of both sexes, who exercise their activities within a "regime of family economy"; these include the farmer, miner, and fisherman, the manner of property access aside (article 201, with wording by Constitutional Amendment n. 20, of 1998). VII - as special policy holders: the farmer, partner, sharecropper and tenant, prospector, fisherman, and the like, who practice their activities, individually or in a regime of family economy, even with the eventual aid of a third party, as well as with their respective spouses or companions, and children above or equal to 14 (fourteen) years of age, as long as they are proven to work within their respective familial group. § 1º A regime of family economy comprehends any activity in which the labor of family members is indispensable for their own sustenance, and is practiced within conditions of mutual dependence and collaboration, without the use of employees (first version of Law n. 8.213, July 24, 1991). VII - proven to have a gross annual income of up to R$ 48,000.00 (forty-eight thousand Reais), per participant involved in the enterprise (CODEFAT, Resolution n. 89 from August 4, 1995). e) resides on the property or in a nearby rural community (Banco Central do Brasil, Resolution 2.191 made August 24, 1995). The rural credit from PROGER RURAL and PRONAF maintained the amplitude of the special policy holders, meeting the needs of property holders and non-property holders (squatters, tenants, and partners), and established two new limitations relative to the size of the enterprise and to the bond between income and the agricultural activity or extraction. Initially, PRONAF did not permit the hiring of permanent employees and PROGER RURAL covered beneficiaries with a larger property than the beneficiaries of PRONAF (up to four fiscal modules, and six fiscal modules for ranchers). On an institutional level, implantation of PRONAF was followed by a redistribution of competencies within the ministries. Provisional Measure n. 1.911-11, from October of 1999, transferred the responsibilities relative to promoting the sustainable development of the "rural segment constituted by family farmers" from the Ministry of Agriculture and Supply to the Office of the Minister in Extraordinary State for Land Policy. In its 12th edition, made November 25, 1999, the Provisional Measure created the Ministry of Land Policy and Agrarian Development, with two areas of capacity: a) agrarian reform; b) the promoting of the sustainable development of the rural segment constituted by family farmers. On January 14, 2000, another edition of the same Provisional Measure instituted the Ministry of Agricultural Development (MDA). On this same occasion, Decree n.3.338 approved the Regimental Structure of the body, which went on to contain the Secretariat of Family Farming with the power to: a) formulate policies and guidelines concerning the development of family farming; b) plan, coordinate, supervise, promote, control, and evaluate the activities related to the policy for the development of family farming; c) supervise the execution of programs and actions in the areas which promote the development of family farmers, fishermen, rubber tappers, extractors, and aqua-cultural farmers; and d) promote the articulation of actions directed toward the rural development within the realm of family farming, prioritizing its decentralized practice and integration with the states, municipalities, and organized society, among other attributes. Even before there was a definition given by a specific law, the family farmers were recognized in other legal norms, for example Law n. 10.177 from 2001, which handled the operations with resources from the Constitutional Funds for Financing the North, Northeast, and Mid-West; Law n. 10.696, from 2003, which instituted the Program for the Acquisition of Food destined for the procurement of agricultural goods produced by this segment, and Resolution n. 3.234, made in 2004 (BACEN, 2004), from the National Monetary Council, which constituted a specific type within the Program for the Guarantee of Agricultural Activity (Programa de Garantia da Atividade Agropecuária - PROACRO) to meet the needs of the "pronaf producers". IV - manages their establishment or enterprise with their family. § 1° The provision made in paragraph I at the head of this Article, does not apply in the case of a rural condominium or other collective forms of property, as long as the ideal fraction per landowner does not exceed 4 (four) fiscal modules. IV - fishermen who simultaneously meet the requisites set down in paragraph I, II, III, and IV at the head of this Article, and are engaged in fishery by hand. § 3° The National Monetary Council - CMN may establish additional criteria and conditions for the access framework to credit lines destined for agricultural families so as to contemplate the specificities of their different segments. (Included by Law n. 12.058, from 2009). § 4° Lines of credit may be created which are meant for cooperatives and associations that meet the minimum percentages of family farmers and benefited raw material, processed or commercialized, arising from those farmers who are within their framework of cooperatives or associates, as determined by CMN. (Included by Law n. 12.058, from 2009). It may be observed that there is a convergence between alterations in the standards that manage the family farmer and those of the special policy holder. In the original wording of the social security law, the use of employees for business activities was not permitted; farmers were only permitted the use of eventual third-party aid. However, PRONAF regulation went on to allow the hiring of up to two permanent employees in 1996 for characterization as an agricultural family and access to the program8. c) spouse or companion, as well as offspring above or equal to 16 (sixteen) years of age, of the policy holder described in items a and b of this section, who are proven to work within their respective family group. (Included by Law n. 11.718, from 2008). § 1° A regime of family economy comprehends an activity in which the labor of the family members is indispensable to the family unit's own subsistence and socioeconomic development and is exercised in a condition of mutual dependence and collaboration, without the use of permanent employees. (Wording provided by Law n. 11.718, from 2008). Bill n. 3.952, which resulted in Law n. 11.326, was presented in 2004. In its justification, the authors highlighted the significant representation of family farmers among national producers and their contribution to social and economic development, and social inclusion within the country. According to them, this occurred despite the fragile institutional structure which attended to agricultural families. Therefore, it was necessary to approve a law that would guarantee the legal foundations for permanent public policies directed toward this group. It is important to note that changes in the legal framework regarding the concept of "family farming" occurred simultaneously at union debates and within academic studies conducted on the topic. As a union category, family farming has gone on to designate certain situations that, until 1990, were viewed as belonging to "rural workers" in a generic sense or, more specifically, to "small producers". On the one hand, this category emerged to envelope a diversity of new social and political identities which were constituted after the second half of the 1970s, and which formed alliances with other segments, such as extraction workers and fishermen. On the other hand, with the formulation the family farmer's own union organization, a greater differentiation was established in relation to other "landless" segments, rural wagers and employees, especially regard to their demands for public policies (MEDEIROS, 1997). The academic studies conducted during this period focused on Brazilian family farming from the standpoint of its development process which is unique from other societies, even utilizing international comparative analysis. An effort was made to define this segment based on the official data that was available, especially from the Agricultural Census of 1985 and 1996. Among the innumerable published works are Kageyama and Bergamasco (1989), Veiga (1991), Abramovay (1992), Neves (1992), Lamarche (1993), FAO/INCRA (1994), Veiga (1995), Abramovay et al. (1996) and FAO/INCRA (1999). To define family farmers in the Agricultural Census according to Law n. 11.326, the method of successive and complementary exclusions was utilized. In other words, for the establishment to be classified as family farming, it must simultaneously meet all the conditions described below. It should be noted that the elaboration of the questionnaires applied by the Agricultural Census precedes the sanctioning of Law n. 11.326, and for that reason there was an attempt to adapt the questionnaire to the statement of law. Another important clarification concerns the research unit used in the Agricultural Census: the agricultural establishment. The concept of family farming is related to the family unit, while that of the establishment is related to the productive unit. Although the most frequent situation is that in which the family is associated with only one establishment, there are cases with more than one agricultural establishment. In this way, there is a small super-estimation9 of the group belonging to the category of family farming in this study, as it considers each establishment as a family unit. Art. 3°. For the purposes of this Law, the family farmer and the rural family enterprise are considered to be those who practice activities in the rural environment, simultaneously fulfilling the following requisites(...). Rural: 1 Belonging or relative to the countryside, or agricultural life; bucolic. 2 Pertaining to the countryside. 3 Situated in the countryside. 4 Agricultural, bucolic, countryman, rustic. (Dicionário Michaelis). Rural: 1. relating to or characteristic of the countryside; situated in the countryside; bucolic; agricultural, rustic or whosoever engages in farming; peasant farmer; farmer (Dicionário Houaiss). An agricultural establishment is every unit of production dedicated, partially or as a whole, to agricultural, forest, or aqua-cultural activities, subordinated to a single administration: that of the producer or of the manager. Apart from its size, legal form, or its location within a rural or urban area, for production with the objective of subsistence and/or trade, thus constituting itself as a registered unit. (IBGE, Agricultural Census 2006: 40). We then chose to use all the agricultural establishments, interpreting "rural" as a synonym for "agricultural", not excluding those located within the perimeters of urban centers from the category of family farming. This decision is also supported by a series of research, among them the Rurbano Project10 coordinated by the State University of Campinas (Unicamp), which evidence the limitation in using the urban/rural criteria. The perfect identification of rural with agricultural would be correct if the location of the rural areas was homogeneous and mono-active, which does correspond with the Brazil's reality. In truth, a continuum occurs in the passage of urban areas to areas with a smaller population density, in such a way that it is not possible to distinguish exactly where the urban ends and the rural begins. Other than the difficulty of defining what is urban and what is rural, even within the areas that are exclusively rural where the population density is very low, there is a significant part of the population that is occupied with non-agricultural activities, with the notable presence of pluriactivity among rural families. d) the concept of "family property" (Law n. 4.504, from November 30, 1964). These cases did not have any type of treatment and the definitions adopted by IBGE were used for identifying the agricultural establishments and making accounts of their total area. It is important to note that tin calculating the ideal fraction, the total area of the establishment was divided by the number of producers that managed the establishment, men or women. Despite the use of the term "proprietors", this procedure was used for all forms of collective producers (proprietors, tenants, partners, or occupants). IBGE also collected data from the production units that did not depend on a specific area. Therefore, on the referenced date, the farmer/producer no longer owned that area; these include, for example, honey farmers, river bed producers in the dry season, producers in protected ranges or roadsides, charcoal producers who owned the ovens and used firewood gathered by a third party, and the extraction, collection, or picking of products that were acquired from natural forests. The farmers in these establishments were classified as "no area producers". II - predominantly utilize their family's own labor in the economic activities of their establishment or enterprise. In order to establish the quantity of family and hired labor within the establishment, the concept of the "work unit" was used, which consists of the work of either a man or woman with 14 or more years of age12 during the agricultural year. For those younger than 14 years of age, half the work period was taken into account. For the purpose of computing the seasonal fractions of labor, the agricultural year was considered to have 260 work days. As such, the sum total of family work units (unidades de trabalho familiar - UTF) was obtained by adding the number of people (both men and women, with family ties, and 14 or more years of age, including the person who manages the establishment) to half the number of people with family ties who are younger than 14, plus the number of employees in "another condition"13 who are 14 or older, plus half the number of employees in "another condition" with less than 14 years of age. The total number of hired work units (UTC) was obtained by the sum of the number of permanent male and female employees and their family who are 14 years or older, plus half the number of permanent employees and their family who are younger than 14 years of age, plus partner-employees and their family members who are 14 or older, plus half the number of partner-employees with family members under 14, added to the result from dividing the fees paid in 2006 by 260, and then added to the result of dividing the contract days by 260. Lastly, if the family work unit (UTF) was smaller than the hired work unit (UTC), then the agricultural establishment was not considered family farming. It should be noted that the term "predominant", from Law n. 11326, was interpreted to mean the simple majority of family labor over that of the hired workforce. In PRONAF, however, there is e different criteria: for the purposes of the framework, farmers with up to two permanent employees may be accepted. Total production value: obtained through the quantitative values of the total production of animals, vegetables, and the added-value of agribusiness. Revenues of the agricultural activity: obtained from the quantity of revenue made through the agricultural activity, from both animal and vegetable products. (AGRICULTURAL CENSUS: 92). The main difference between the concepts above is the production intended for personal consumption, especially that which is meant to nourish the family and which, evidently, should be calculated as part of the family income, but is not included in the sales revenue of the agricultural establishment. In this sense, the use of the total production value is more appropriate for calculating family income, because it considers the produce that is intended for the family's nourishment.  Gross value of adjusted production: total production value, subtracted by the production value of corn and fodder for animal consumption.  Value of corn production for animal consumption: if there was a record of grain corn as a seasonal crop and the quantity produced in 2006 was greater than the quantity sold in 2006, and one of purposes of production was for consumption, then the "value of corn production for animal consumption" was equal to the quantity produced in 2006, minus the quantity sold in 2006, multiplying the result by the average unit price of the product.  Value of fodder production for animal consumption: for those establishments where there was a record of seasonal crop produce such as fodder for cutting, sugar cane, corn fodder, forage sorghum, or fava beans, then the "value of fodder production" was obtained from the total that was gathered from the quantity produced in 2006, subtracted by the quantity sold in 2006, and its result multiplied by the average unit price of the respective product. Other than the "gross value of adjusted production", the other revenue that were not calculated in the animal and vegetable production were taken into account, identified here as "indirect agricultural revenue", such as revenue arising from rural tourism, mineral exploitation,the provision of processing services, non-agricultural activities, and those of agribusiness. In the case of agribusiness revenue, they were only taken into account if at least 70% of the raw material used came from the establishment itself. Lastly, to calculate the enterprise's income, the adjusted production value was added to the indirect agricultural revenue, and the total current expenditure of the establishment was derived. Total Income of the Enterprise > Revenue from the remunerated activities of the producer outside the establishment. As such, if in 2006 the total revenue of the enterprise was smaller than the quantitative revenue from the remunerated activities of the producer outside of the establishment, then the agricultural establishment was not considered a family farm. It must be noted that the procedures above used excessive zeal in the interpretation of the legal statement, as even income from wages outside the establishment might be interpreted as integral parts of the family stratagem. Furthermore, income outside of the establishment may be the result of a conjunctive situation in the family, born from crop failure, illnesses in the family, or others. They also opted not to consider wages obtained outside the establishments as following the same guidelines provided by PRONAF, which stipulates that only family income from the agricultural and non-agricultural exploitation of the establishment should be taken into consideration14. A last important observation about the composition of the family income: that which was not a result of the productive activity was not taken into account when calculating of the family income, such as revenue from disinvestment, donations, or volunteer aid from family or friends. The revenue from government transfers in the form of retirement funds, pensions, or even social programs were also not considered when calculating the family income, following the same guidelines provided by PRONAF, which does not consider social benefits and the pension income derived from rural activities.  The legal state of the establishment was registered as a cooperative, a corporation (or limited liability), an institution of public utility, government (federal, state, or municipal) or in another condition15. I - foresters who simultaneously meet all the following requisites set down at the head of this article, cultivate native or exotic forests, and promote the sustainable management of those environments. This item added a new condition for foresters, that of promoting the "sustainable management" of native or exotic forests. However, it is not possible to verify this in the Agricultural Census of 2006. Therefore, foresters were classified only by the previously appointed questions. For farmers, establishments where the area of the tanks, lakes, and dams were greater than two hectares were eliminated. The areas with cages were not registered by the Agricultural Census. III - extractive workers who simultaneously meet the requirements made in items II, III, and IV at the head of this article and practice this activity by hand in the rural environment, excluding miners and diggers.  there were temporary employees during the harvest, and the number of daily wages paid exceeded 30 days. As for the miners and diggers, these were not recorded as such by the Agricultural Census of 2006. Fishermen were not recorded by the Agricultural Census of 2006, and for that reason this statement was not applied. The next step in the methodology was to identify the variables from the Agricultural Census data bank and apply all the concepts described above. The described methodology was applied and processed, generating the information that was already available in the publication of IBGE, "Censo Agropecuário 2006 - Agricultura Familiar, Primeiros Resultados" (IBGE, 2009). To illustrate the methodological, the principal results are presented below. Among the 5,175,489 agricultural establishments registered in 2006 by IBGE, 4,367,902 were classified as family farms according to the criteria found in Law n. 11.326, representing 84% of Brazilian agricultural establishments (Table 1). Despite their numeric importance, they occupy an area of little more than 80 million ha, which is the equivalent to 24% of the area of the establishments. However, the no family farming establishments, despite representing only 16% of the establishments, occupy 76% of these establishment areas. The disadvantage in the occupation of productive space is due to the following fact: while the average area of the family farm establishment is 18.37 ha, the industrial farms have an average area of 309.18 ha. Evidently, the average size of the establishments was limited by the adopted methodology of up to four fiscal modules, but the size of the industrial establishments reveals, once more, an unequal distribution in the access to Brazilian lands. Almost ¾ of the occupied labor in the countryside is tied to the family establishments, which represents little more than 12 million people, while the industrial farms occupy only 4.2 million people. The expressive occupation of workers by the family establishments highlights the importance of these establishments in generating employment in the countryside. Despite their occupying only 24% of the area, the family establishments answer for 38% of the gross production value and 34% of countryside revenue. This better use of the area by family farming is evident in Table 2: while family farming generates R$ 677/ha, no family farming generates only R$ 358/ha. Family agricultural is also more intensive in occupying the labor force: it occupies 15people per 100 ha, while industrial farms occupy less than two people per 100 ha. 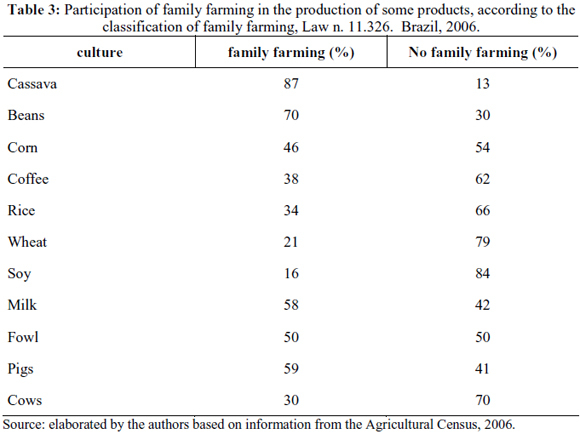 The results from classifying the establishments according to Law n. 11.326 also confirm the importance of family farming in guaranteeing nutritional security (Table 3), supplying the produce that is characteristic to the internal consumer market: 87% of cassava production, 70% of the bean production, 59% of the herd of pigs, 50% of the flock of fowl, and 58% of milk production. The results call attention to the strategic role of family farming for controlling inflation in the prices of food. The complete results of the classification of the agricultural establishments can be accessed on "Sistema IBGE de Recuperação Automática" (SIDRA), at www.sidra.ibge.gov.br. The construction of algorithms to define the family farming group according to the statement of Law n. 11.326 innovated in an attempt to combine the preexisting variables. This is because the Law was drafted after the elaboration of the Agricultural Census questionnaire for 2006. The adopted methodology is the only alternative for this definition. Its results have been shown to be consistent and quite near to the results of previous inquiries, such as FAO/INCRA (1999). With the definition of family farming in the Agricultural Census of 2006, a new work agenda is revealed that will deepen public policies on family farming, such as the use of the area, levels of productivity and technology adopted, income, need for credit, environment, and others. ABRAMOVAY, R. Paradigmas do capitalismo agrário em questão. São Paulo: Hucitec-Edunicamp-Anpocs, 1992. ABRAMOVAY, R. et al. Novos dados sobre a estrutura social do desenvolvimento agrícola em São Paulo. Agricultura em São Paulo, 43, t. 2, 1996. BACEN. Resolution 2.191 from August 24, 1995. Available at <https://www3.bcb.gov.br/normativo/detalharNormativo.do?N=095168240&method=detalharNormativo>. Accessed on 7/1/2010. BACEN. Resolution 2.310 from August 29, 1996. Available at <https://www3.bcb.gov.br/normativo/detalharNormativo.do?N=096183941&method=detalharNormativo>. Accessed on 1/7/2010. BACEN. Resolution 3.234 from August 31, 2004. Available at <https://www3.bcb.gov.br/normativo/detalharNormativo.do?N=104142208&method=detalharNormativo>. Accessed on 1/7/2010. BACEN. Resolution 3.559 from March 28, 2008. Available at <http://www.bcb.gov.br/?ESPECIALNOR>. Accessed on 1/7/2010. BRASIL. Decreto n. 1.946 de 28 de junho de 1996. Available at <http://www.planalto.gov.br/ccivil_03/decreto/D1946.htm>. Accessed on 1/7/2010. BRAZIL. Law n. 8.629 from Thursday, February 25, 1993. Available at <http://www.planalto.gov.br/ccivil_03/Leis/L8629.htm>. Accessed on 1/7/2010. BRAZIL. Law n. 11.326 from Monday, July 24, 2006. Available at: <http://www.planalto.gov.br/ccivil_03/_Ato2004-2006/2006/Lei/L11326.htm>. Accessed on 1/7/2010. BRAZIL. Law n. 11.718 from Sunday, July 20, 2008. Available at: <http://www.planalto.gov.br/ccivil_03/_Ato2007-2010/2008/Lei/L11718.htm>. Accessed on 1/7/2010. BRAZIL. Law n. 12.058 from Tuesday, October 13, 2009. Available at: <http://www.planalto.gov.br/ccivil_03/_Ato2007-2010/2009/Lei/L12058.htm>. Accessed on 1/7/2010. BRAZIL. Conselho Deliberativo do Fundo de Amparo ao Trabalhador- CODEFAT. Resolution n. 89, from August 4, 1995. Available at: <http://www.mte.gov.br/Legislacao/Resolucoes/1995/r_19950804_89.pdf>. Accessed on 1/7/2010. FAO/INCRA. Diretrizes de política agrária e desenvolvimento sustentável. Brasília: FAO/INCRA, 1994 (Summerized version of the final project report UTF/BRA/036). FAO/INCRA. GUANZIROLI, C. E. e CARDIM, S. C. S (coords.) Novo retrato da agricultura familiar. O Brasil redescoberto. Brasília: FAO/INCRA, 1999 (Projeto UTF/BRA/036). HOUAISS. Dicionário da Língua Portuguesa. Available at <http://www.dicionariohouaiss.com.br/index2.asp>. Accessed on 1/8/2010. IBGE. Censo Agropecuário 2006: Brasil, Grandes Regiões e Unidades da Federação. Rio de Janeiro, 2009. IBGE. Censo Agropecuário 2006: Agricultura Familiar - Primeiros Resultados. Brasil, Grandes Regiões e Unidades da Federação. Rio de Janeiro, 2009b. IBGE. Censos 2007-Censo Agropecuário 2006. Manual do Recenseador CI 1.09A. Rio de Janeiro, 2007. KAGEYAMA, A. e BERGAMASCO, S. M. P. P. Novos dados sobre a produção familiar no campo. In: XXVII Congresso Brasileiro de Economia e Sociologia Rural, 1989, Piracicaba. Anais... Brasília: SOBER, 1989. LAMARCHE, H. (org.). A agricultura familiar. Comparação internacional. Uma realidade multiforme. Campinas. Unicamp. 1993. MEDEIROS, L. Trabalhadores rurais, agricultura familiar e organização sindical. São Paulo em Perspectiva, São Paulo, v. 11, n. 2, abr./jun. 1997. MICHAELIS. Moderno Dicionário da Língua Portuguesa. Available at <http://michaelis.uol.com.br/>. Accessed on 1/8/2010. VEIGA, J. E. O desenvolvimento agrícola: uma visão histórica. São Paulo: Edusp/Hucitec, 1991. (Estudos Rurais, 11). VEIGA, J. E. Delimitando a agricultura familiar. Reforma Agrária, Campinas, v. 25, n. 2 e 3, mai./dez. 1995. DEL GROSSI, Mauro Eduardo e MARQUES, Vicente P. M. de Azevedo. Family farmers in the 2006 agricultural census of Brazil: the legal context and options for their identification. Estudos Sociedade e Agricultura, abril de 2010, vol. 18, n. 1, p. 127-157, ISSN 1413-0580. 1 Professor at the University of Brasilia and Special Advisor at the Ministry of Agricultural Development. E-mail: mauro.delgrossi@mda.gov.br. 2 Master of Latin-American Integration (Prolam/USP), Federal Agrarian Expert at the National Institute of Agrarian Colonization and Reform (INCRA). E-mail: vicente.marques@poa.incra.gov.br. 3 Article 4°of Law 8.629, 02/25/1993, defines the "small" property as an area between 1 and 4 fiscal modules, and the "medium" property has having more than 4 to 15 fiscal modules. Although the Law does not define the "large" property, this is usually obtained by exclusion. 4 Article 4º of Law n. 8.629 from February 25, 1993, determines the regulation of the constitutional provisions relative to agrarian reform. 5 Later revised by Law n. 11.718 on the 20th of June, 2008. 6 Resolution of the Deliberative Council of the Worker's Support Fund (Conselho Deliberativo do Fundo de Amparo ao Trabalhador) n. 89, August 4, 1995. 7 Resolution of the National Monetary Council (Conselho Monetário Nacional) 2.191 from 1995 (BACEN, 2005), and Decree 1.946 made June 28, 1996, which was later revised by Law n. 11.326. 8 Since Resolution 2.310 of the Brazilian Central Bank (Banco Central do Brasil -BACEN 1996) made in August of 1996, farmers that hire up to two permanent employees are admitted into PRONAF. Currently, Resolution 3.559 from the Brazilian Central Bank, made March 28 of 2008, defines PRONAF beneficiaries as being those farmers who: I - farm a piece of land in the condition of proprietor, squatter, tenant, partner, or lessee of the National Program for Agrarian Reform or PNRA (Programa Nacional de Reforma Agrária); II - Reside on the property, or in a nearby location; III - do not withhold, by any title, an area greater than 4 (four) fiscal modules, quantified in accordance with the current legislation; IV - obtain at least 70% (seventy percent) of their family income through the agricultural and non-agricultural exploitation of the establishment; V - maintain family labor as the predominant form for the exploitation of the establishment, utilizing wage labor only on occasion, according to the seasonal requirements of the agricultural activity, the maintaining of up to 2 (two) permanent employees being permitted. 9 The National Survey by Household Sample (Pesquisa Nacional por Amostra de Domicílios - PNAD) of IBGE, that does not utilize the census sector in its interviews, capturing all the areas of the declarator, points out that the participation of farmers with more than one area of enterprise was only 0.8% in 2007. 10 For more information, see research projects from Núcleo de Enconomia Agrícola (NEA-Unicamp), Available at http://www.eco.unicamp.br/pesquisa/NEA/pesquisas/rurbano/. 11 Available at http://www.incra.gov.br, Legislação, Instruções Especiais: n. 20 de 28/5/1980, n. 23 de 25/3/1982, n. 27 de 06/5/1983, n. 29 de 08/2/1984, n. 32 de 23/1/1985, n. 39 de 05/1/1990, n. 33 de 29/1/1992, n. 51 de 26/8/1997, n. 01 de 14/12/2001, e n. 03 de 11/4/2005. 12 Variable obtained according to the guidelines recommended by the Program for Generating Rural Employment and Income (PROGER RURAL) of the Federal Government, which considers 1 work unit to be a man or woman 14 years or older, and ½ a unit to be a man or woman younger than 14 years of age. 13 Refers to the residents, tenants, etc. and those who were not classified as employees, either permanent or temporary, nor as partner-employees. 14 Resolution n. 3.559 from March 28, 2008 (BACEN, 2008). This provision is also stated in the Declaration of Aptitude-(DAP) to PRONAF, which is a mandatory document for all family farmers who intend to finance within PRONAF, in which the participation of labor revenue outside of the productive unit is one of the criteria for gaining access to the program. 15 Except for individual and condominium producers, trusts or partnerships.